This image is Plate IX from "Speculum Veritatis", a famous 17th century hermetical manuscript, in a coloured version by Adam McLean. 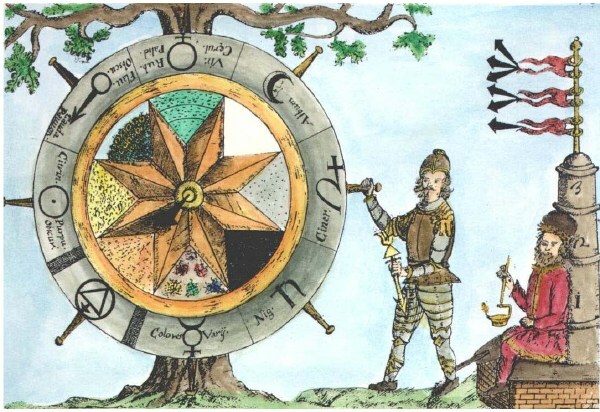 It shows Cadmus turning the wheel on which the seven traditional metals (clockwise from 9 o'clock: gold, iron, copper, silver, tin, lead and mercury) as well as sulphur are represented. The wheel has to be turned three times (represented by the three flags on the right), going through eight consecutive phases characterized by colour changes, in order to complete the alchemical process. The figure sitting near the oven on the right is Vulcanus. The figure also can be interpreted as highlighting the essence of the SUBAT project, which consists of an appraisal of different battery technologies (represented by the different metals), and in particular the NiCd battery (represented here by Cadmus after whom the cadmium metal was named). The three turns of the wheel stand here for the three pillars of the study (technical, ecological and economical). This allegorical representation reminds us of the wisdom of the old philosophers, which, being of a hermetic nature and thus difficultly accessible for the lesser mind, may largely be forgotten in today's materialistic world, but which, through assiduous study, will provide valuable insights towards the construction of our image of the world.